Hi guys!! 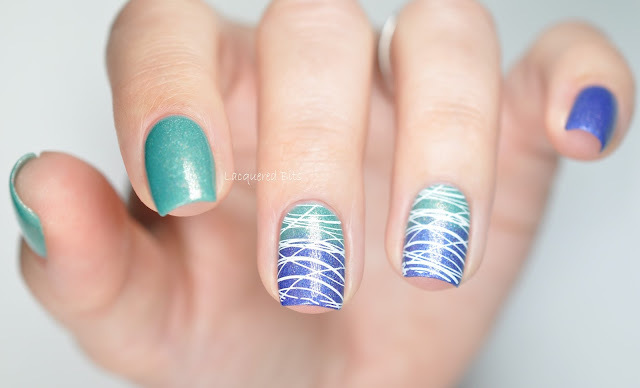 Today I have a white stamping over gradient for you. Do you like it? If you do, just continue reading and you will see what polishes I used and how I did this mani. 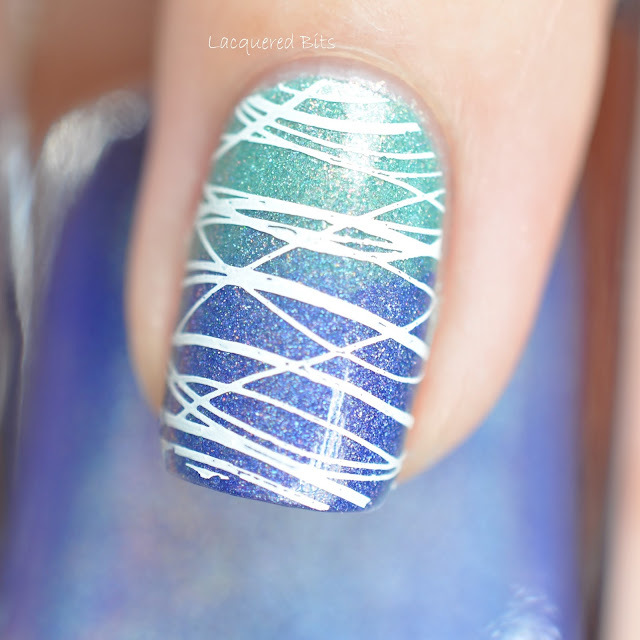 So, my base on four fingers was Colors by Llarowe – Well Done! Woo! Woo! Woo! and on my pinkie I applied Colors by Llarowe – A Lot More Help Sucking Up. Here they are. They were both easy to apply and opaque in two coats. After they were dry, I used Cuticle Defender by Kaleidoscope, well as the name suggests, to protect my cuticles from the mess of the nail art. Next I sponged on the gradient using both of the hues. Then I applied fast drying top coat and waited for my mani to dry. After the manicure dried, I stamped on this pattern using MoYou London stamping plate No. 8 from the Holy Shapes Collection and Special Paint For Stamping Nail Art in white by Kaleidoscope. And when I was finished with stamping, I removed the Cuticle Defender with tweezers. Also the clean up after that was minimum. So, what do you think about it? Do you like it? I do, it’s kind of fun and unusual and I like that.